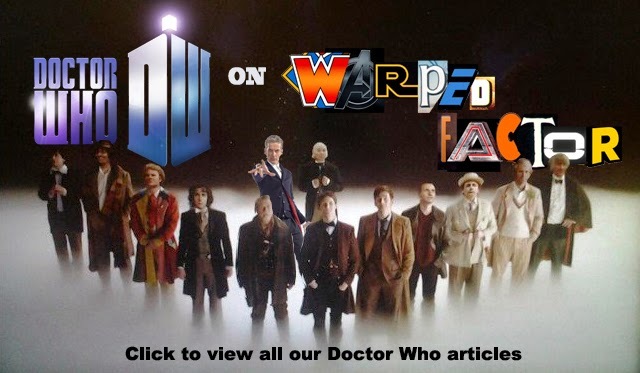 DOCTOR WHO: Series 9 Archive Page | Warped Factor - Words in the Key of Geek. 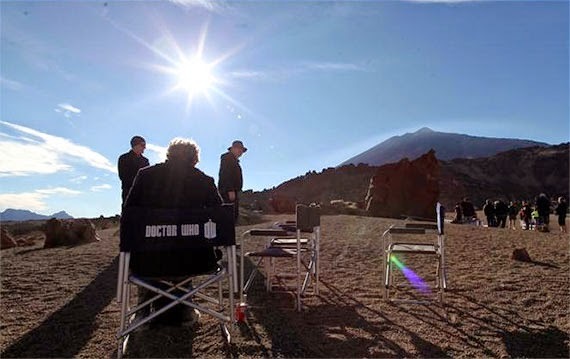 Our archive page of previous Doctor Who series 9 updates and filming information. Everything we know as fact will be presented in regular type, anything that's rumoured but looking likely will be written in italics. You'll find links throughout to all the original news stories and articles containing further information. You may want to bookmark this page and check back often as we'll keep updating it with all the new Doctor Who series 9 news as and when we get it, right up to when the first episode debuts. Be warned that there are potential SPOILERS throughout! So without further ado, let's get on with it. Find all the episode information on our main Series 9 page here. "As ever, Doctor Who is a combination of complete daft silliness and loads of people getting slaughtered in the early evening. Tonally, [series 9 will be] very much the same [as series 8]. Peter is getting stronger and more confident in the role." After a lack of two-part stories, the BBC have confirmed that Series 9 will open with two of them back to back, episodes 1 & 2, and episodes 3 & 4. 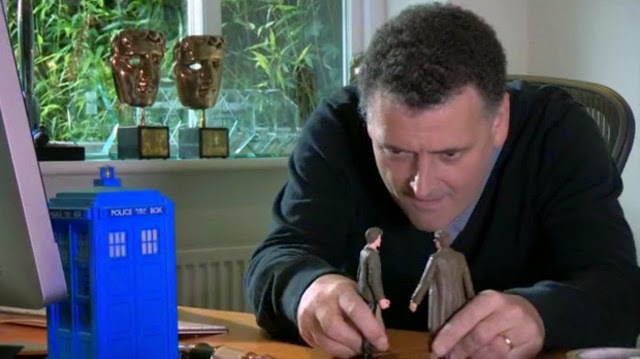 Obviously Steven Moffat will be providing a handful of scripts. He's confirmed he's at least responsible for the penultimate episode, and will most likely be writing the series opener, the finale and the Christmas Special - at least. In March last year Mark Gatiss confirmed that he was writing two episodes for Peter Capaldi. Series 8 saw his Robot of Sherwood script air, so presumably the other episode is for this series. What his other episode involves is unknown but in a separate interview Gatiss spoke about his desire to pen another Ice Warriors story to follow his 2013 script, Cold War. "I’m in the midst of [writing] that right now – I broke off to come here today, in fact, but I’m hoping to finish the script tonight. It has been a tough nut to crack, but I’m delighted with how scary it is. I can’t say any more than that." 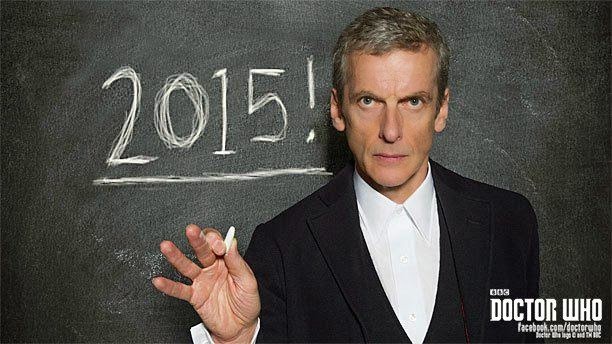 Neil Gaiman has ruled himself out of series 9, but is determined to write for Capaldi's Doctor in the future. "There’s a whole bunch of stuff I want to do [but] I have to find out from Steven what his intentions for the Doctor are and what sort of stories he wants me to write." 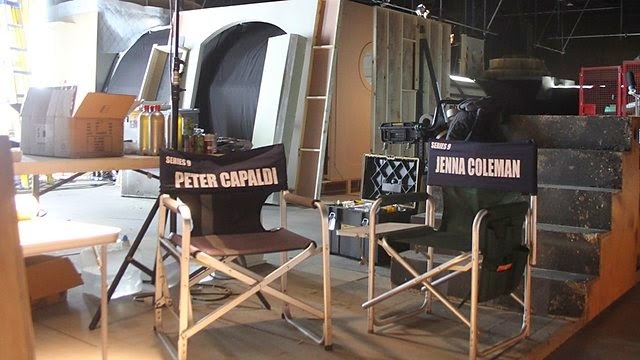 Other writers rumoured to be writing for series 9 include Gareth Roberts, Peter Harness, Jamie Mathieson, Jack Lothian, Chris Chibnall, Toby Whitehouse and Phil Ford. Peter Jackson is still in discussion to direct an episode. 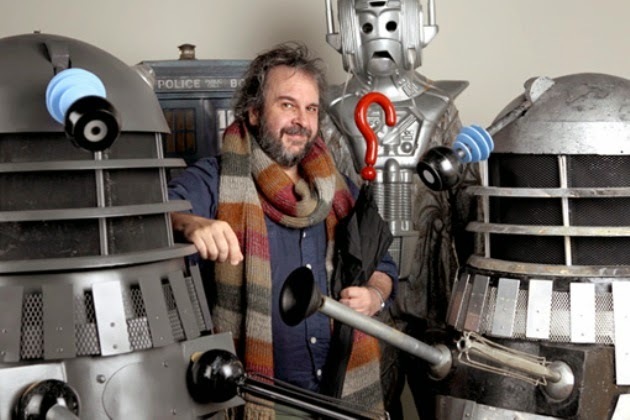 He revealed that talks are "actually kind of serious", and went on to say that now he has finished work on The Hobbit trilogy "I would be very happy to [direct an episode of Doctor Who]." Daniel O'Hara is the first director confirmed for series 9. He will be directing 2 episodes (Block 1). Although he's new to Who, O'Hara has previously directed Being Human, Silent Witness and Wizards Vs Aliens. 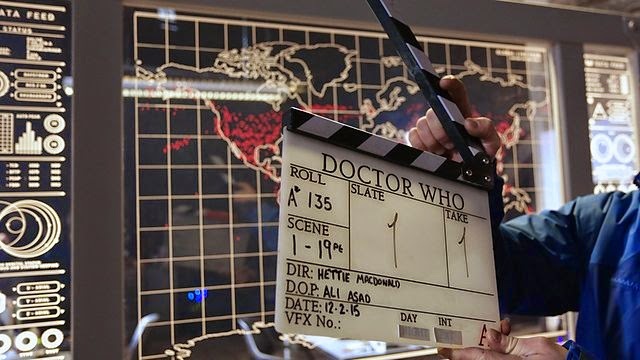 UPDATE Jan 21st: Hettie MacDonald, the director of Blink, will be behind the camera for at least one episode of series 9. UPDATE Feb 12th: MacDonald will be directing Block 2, which likely includes the opening episode. Rachel Talalay, who was resposnible for series 8's two-part finale Dark Water/Death In Heaven, has had "talks" about returning to direct. Paul Wilmhurst (Kill The Moon, Mummy On The Orient Express and Last Christmas) is heavily expected to be returning for at least two episodes. Douglas MacKinnon, who will be directing the 2015 Sherlock Christmas Special (that started filming January 2015), is also rumoured to return to Doctor Who for series 9, following his three successful series 8 episodes, Listen, Time Heist and Flatline. Block 1 consists of episodes 3 and 4, and began production on Monday January 5th in Cardiff. Paul Kaye is the first confirmed guest star. His character name is Prentis. 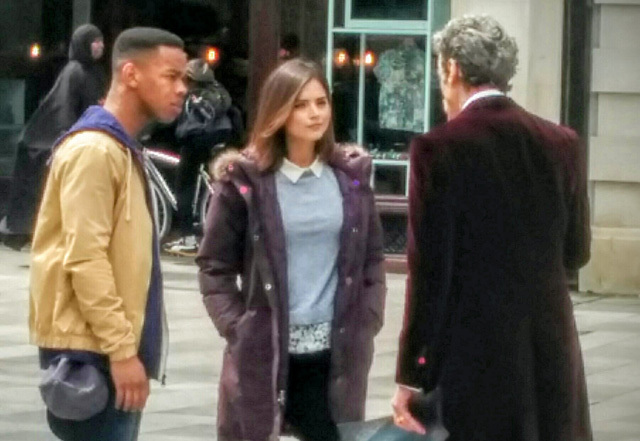 Exact episode is unknown, but he is in Block 1 of filming. Colin McFarlane is the second confirmed guest star for series 9. He is already filming so will appear in a Block 1 episode. McFarlane has previously starred in Torchwood: Children of Earth as General Pierce. Daniel O'Hara is directing, find more details about Block 1 here. Red dots on a world map… What d’you think it means? Jemma Redgrave aka Kate Stewart has been spotted on set, along with several extras in UNIT uniforms. Although it's likely to be for the opening episode, that has not been confirmed. Going to Spain on a location recce for the DR.
David Schofield join the cast as Odin for both episodes 5 and 6 (the part was to be played by Brian Blessed but he had to withdraw due to illness). It's been rumoured that these 2 episodes could be a Viking adventure, and the character name of Odin certainly adds to that idea. New images have leaked online showing Maisie Williams dresses as a highway robber, possibly this two-part story takes place in multiple time periods. Block 4 will consist of episodes 7 and 8. The BBC released a short read through video featuring Jemma Redgrave who will return as Kate Stewart for these episodes. View a full gallery of images from the June 10th Block 5 filming here. That's everything for now, remember to visit our main Series 9 page for all the episode information, and we will keep updating them both with all the new Doctor Who series 9 news as and when we get it, so check back often. Plus follow us on Twitter & Facebook for up to date Doctor Who news and much more.